But tile doesn’t always have to be used to create ornate or intricate designs in order to make a statement. Classic shaped tiles with a textured finish in neutral colors can give the space a very calming and soothing vibe. It’s the perfect material to use when you want the space to have movement and visual interest without using bright, bold colors. There are an endless number of ways to incorporate tile into your designs. This week I want to share a few minimalist tile ideas that are anything but boring. 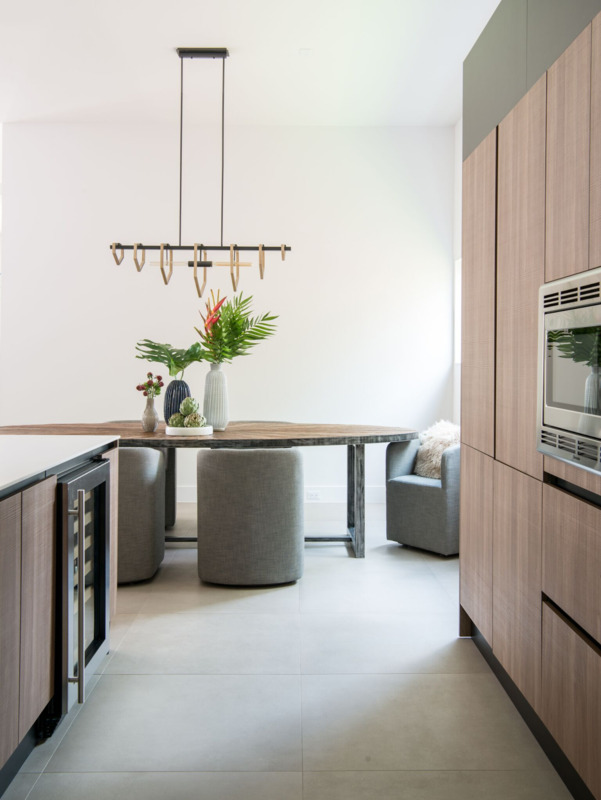 These spaces use a neutral color palette, incorporate lots of texture, and focus on creating space with minimal detailing. This bathroom beautifully blends natural textures like wood and marble with different shapes to create a space inspired by nature. The black tiles on the wall create the illusion of a honeycomb and the gold accents give the space a honey-toned glow. It makes the perfect backdrop for the round mirror. The marble and wood vanity adds a nice textural contrast to all the tile and helps break up the black and white color palette. Less is more when it comes to the tile in this shower. Using tiles in different sizes but in the same neutral color palette makes the shower seem larger and more open. Adding the patterned tile adds a bit of character, while still maintaining a minimalist approach. What I love about this bathroom is the natural light and how spacious it feels. The open vanity gives you tons of storage space and prevents the counters from getting cluttered. And using a floor tile in a similar color to the vanity gives the space a cohesive feel. The unique tile pattern around the mirror reflects the blue tones in the vanity and adds a bit of unexpected detail. Using larger floor tiles is one way you can make a room feel more spacious. In this kitchen, grout lines are kept to a minimum. This creates a more monumental look on the floor rather than something with lots of little pieces. And by choosing to match the tile and grout color, it gives a more seamless look. It removes visual distractions and allows your eye to focus on the pops of green on the table and the mixed metal accents. White paired with a light gray is a fabulous alternative to the all white kitchen. It’s a cool, serene color combination that makes the space feel airy and open. To create the illusion of a deeper counter, we paired a large white subway tile with a gorgeous white marble countertop. The counter mimics the gray paint on the cabinets, while the horizontal cabinet hardware mirrors the lines of the tile. The sleek, but simple design is anything but boring. Clean, crisp lines and a black and white color palette give this kitchen a bit of an edgy vibe. The large square floor tiles create the perfect backdrop to this high-contrast space and allow your eye to move effortlessly around the kitchen. 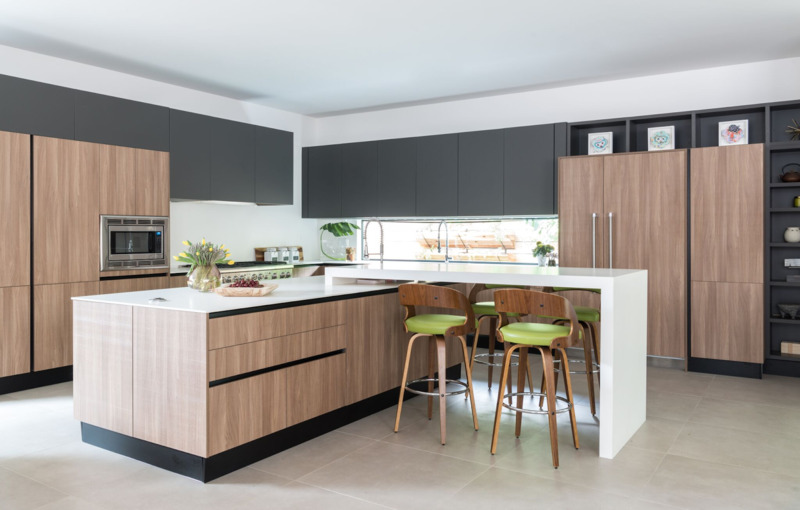 The wood grain cabinets and stools, along with the unexpected pop of green bring warmth and softness to the space. 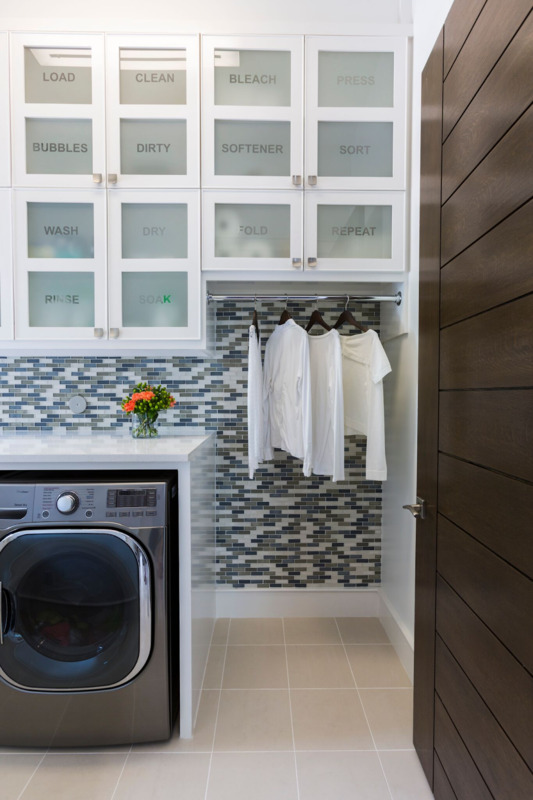 Using tile to create detail is a fabulous way to add visual interest, especially in a functional space like the laundry room. The unique, organic pattern on the wall brings to mind the movement of water while the neutral floor tiles help anchor the space. The white counters and walls make the room appear larger and the witty glass front cabinets add a whimsical touch. It’s a chic, minimalist space that’s stylish and functional. Tile is also a wonderful alternative to hardwoods and is often unexpected! A light colored, over-sized porcelain tile evokes a serene feeling in this bedroom. A large rug placed under the bed warms up the tile and makes sure you have a soft place for your feet to land in the morning. 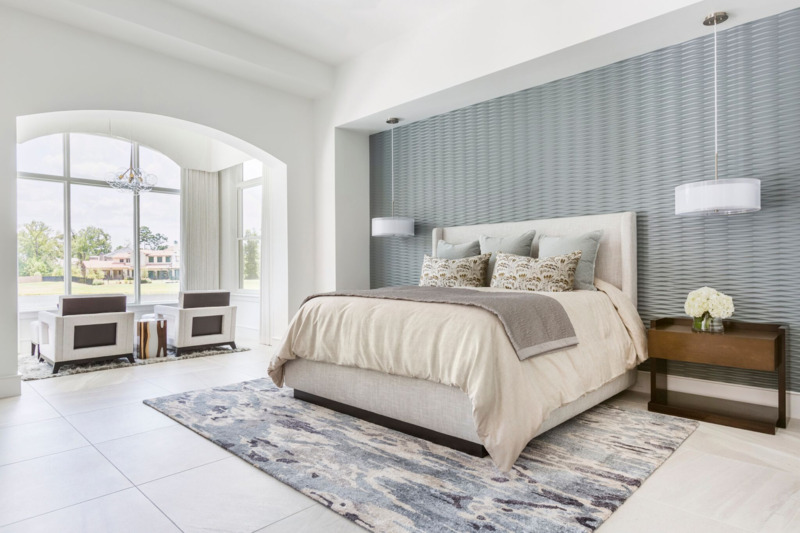 Because the tile color coordinates seamlessly with the walls, your focus is drawn to the movement in the rug and the gorgeous textured accent wall behind the bed. The accent wall pulls the room together beautifully! Tile can provide a functional backdrop for a design, but that’s not all it can do. And is on a mission to prove how artful tile can be. Their heirloom quality tiles are sourced from all over the world and show how everyday surfaces in your home can be beautiful and functional. One of my favorite tiles is their tile. When I saw them, I immediately fell in love. These unglazed brick tiles come in a textured or smooth finish that instantly add a earthy vibe to any space. They range in color from light honey to smoky black, which makes this modern, minimalist brick tile easy to use in any style space. Sometimes less is more, but that doesn’t mean it has to be boring. By focusing on creating space, using neutral colors and utilizing texture, you can easily design a visually stunning minimalist inspired space. I hope today’s post gave you some fresh ideas for ways to create more minimalist style tile designs for the home. For more of my favorite tile design ideas, follow along on . I find it interesting that you shared the current tile trends in this blog and which areas of the home they will shine. Personally, I like the White paired with a light gray tiles for kitchen, CLÉ tile and Foundry Flats tiles. There are so many fun ways to use tile! I especially love to mix and match. Pairing a classic tile with something more modern (think penny rounds + large porcelain) looks particularly luxurious and thoughtful.